As you may know, we’ve gathered a number of artifacts and memorabilia commemorating and celebrating the history of Four Roses to share with you on our 130th Anniversary webpage. 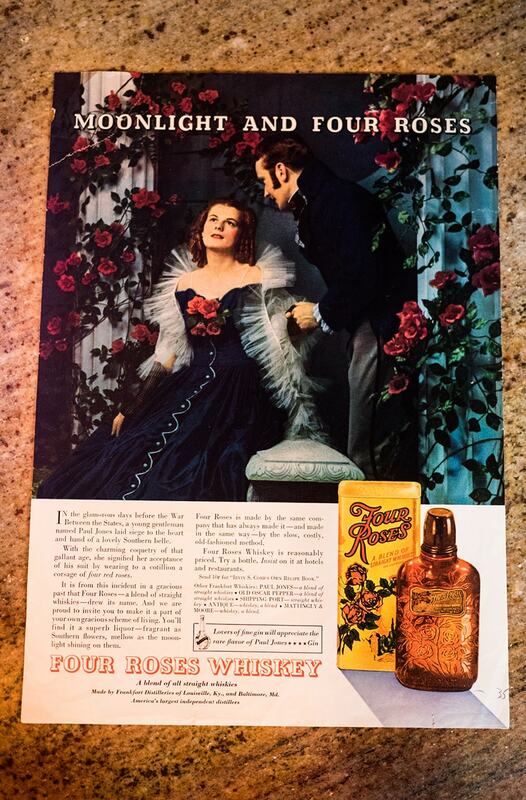 We sat down with Senior Brand Ambassador Al Young, who has been working to compile the Four Roses archive collection for years, to get a more exclusive look at some of the unique advertisements that have been used through the decades. The presentation was designed to capitalize on the excitement created by Margaret Mitchell’s best-selling novel later turned into the movie version of “Gone With The Wind”. Once Again…It’s time to make a bowl of Merry Christmas! 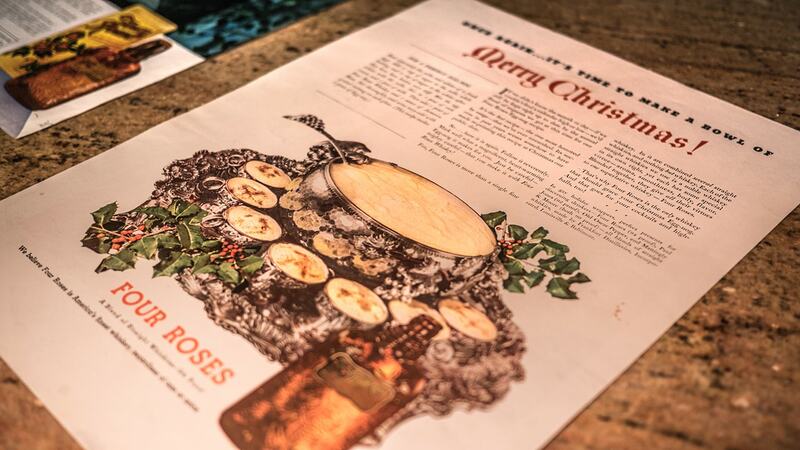 Frankfort Distilleries launched this Four Roses advertisement in 1936 with a headline that read Once Again…It’s time to make a bowl of Merry Christmas! The holiday campaign, which was included in popular magazines of the time, featured a recipe for eggnog using Four Roses Whiskey. The recipe became a fan-favorite of consumers. People would clip it, fold it and put it in the family cookbook to surface time and time again during the holidays. In later years, different versions of the advertisement featuring the same elegant silver punch bowl and cups were used. The copy mentions “if we didn’t know the month or day—if we couldn’t find a calendar high or low—we’d still be kept right up to date by the annual flood of requests we get at this time for our Four Roses Egg Nog recipe.” This phrase still holds true, as we continue to receive requests today for this beloved recipe around the holidays each year. 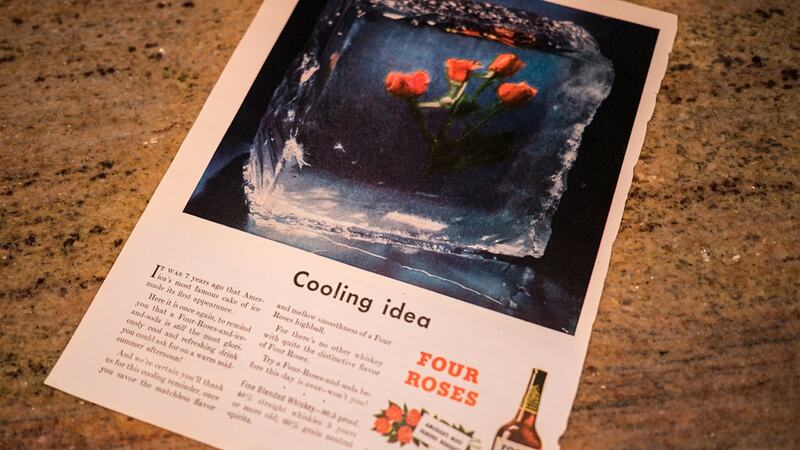 This advertisement, launched in 1947, used the idea of four red roses frozen in ice to convey the refreshing idea of the Four Roses brand. The original concept also called for an actual ice block with roses frozen in it to be displayed at retailers. In most cases, the ice thawed too quickly to be effective. A portion of the copy reads as follows, mentioning the same “cake of ice” that was used in a 1940 advertisement.